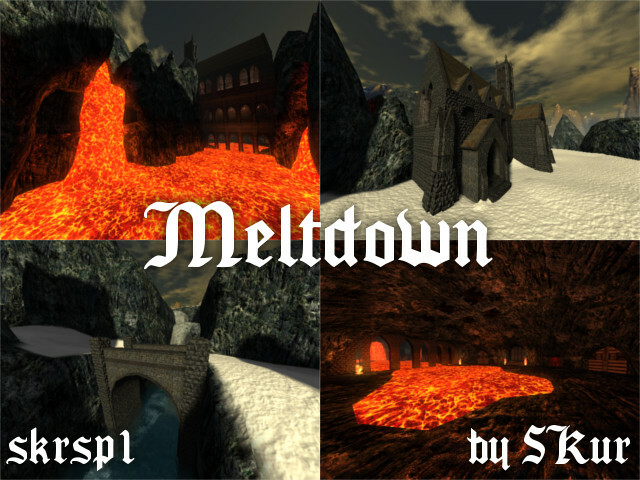 Meltdown is a fairly large Singleplayer campaign with plenty of scripting. It contains large open outside areas mostly covered with ice and snow, but also rather narrow pathways and caves in the lower levels, which mainly consist of volcanic rock and lava. The buildings are kept in a medieval style, which also defines when the story is taking place. The gameplay is oriented to classic arena shooters like quake, but also has elements from other games. Aside from shooting up monsters the map also contains some jumping puzzles, same as some intended trickjumps for speedrunners and such (If you're doing really good the script might even comment on it, hehe). You shouldn't have any problems with finding enough ammo since i placed plenty of it, because for me there is nothing worse than having to use my pistol. If you notice any bugs, get stuck, or have any suggestions please leave a comment so I can fix/improve it. If you really want to help me with the optimization and balancing it would be awesome if you would record your really first playthrough and send it to me, since that would show me how it works for players not having played it 100 times and knowing every corner (so don't feel ashamed if u die a lot, it's my fault!). I recorded a timelapse video in 2fps FullHD with the ingame recorder, which has later been speeded up x15 to 30fps. It covers the creation of all the geometry, texturing and lighting until version 1.0 of the map. I did not record the moster placing and scripting, as it required endless playtesting, what isn't very interesting to watch. The video is five and a half hours long and I obviously don't expect anyone to watch the whole video, but I had to uplaod it as it was there and you might find one or the other part interesting. :) Would be nice if you leave a coment on YouTube too, but that's up to you of course! - Housedoor opens again now, if you die before the first respawnpoint. Special thanks to Yves 'evillair' Allaire and Gregor Koch for the textures. Skur,your map is the best on this challenge. Thank you for you work and your time. Will be later i will write more about this map but at this moment i don't have time for it. Those two parts are arenas, where you have to kill several waves of enemys to proceed. You unlock the first wave by entering the arena, the second one by killing the first one and the third one by entering the ammo+quad chamber, which is being unlocked once you killed the second wave. I fixed a little bug, which let you enter the arena without triggering the first wave, but I'm not sure if that's what caused your problem, since that was only in the first arena and you already heard the "Let's fight", which is triggered by the same trigger. I could also not reproduce the error of only few monsters falling down from the ceiling, but that could eventually happen if you entered editmode while in sp without resetting the script and walking through the right triggers before entering the arena again. Another possible cause of the problem could be a script using clearsleep or something like that, so if you are running any scripts/mods that might affect the maps script I recommend disabling them. Aside from that I can't help you much, since I, as I already said, can't reproduce the error and other people made it through the map without problems already too. I'd be glad if you could try to play the map again after the little patch I made and maybe give a little more detailed information about what excactly happened. For example if there were some or no monsters at all falling out or if you heard the sound the _first_ time you entered the arena (before going into edit mode). Make it multiplayer so IgC can finish it =P. I will show you ingame. There! I discovered it, when walking backwards shooting at the monsters in front of the church. Besides that I'd like to say, that this map is awesome. There are some minor texture and architecture issues, which can easily be fixed. Plus the lightning could be tweaked a little bit: There are a lot of lights without sources e.g. What about adding a last stage/level, where you have to bring back the gold to the house? 8/10 so far. Good work. Wow, this map brought me back to singleplayer mode. The visuals are fantastic and the gameplay is pretty nice. It is not to easy and not to hard. The length was also quite good and the atmosphere was just fantastic. I also haven´t noticed any bugs, so I think that 10 points would be good for this awesome content ! As I could only think what this map is missing (and what isn't nentioned yet) is some more details outside (like trees and such, maybe even a textureblended path to the church?). The trim on the side face of the bridge across the water could be noclipped and maybe some small secret inside the water? You could have taken a different dudv-map to let the water really flow away (unlike the odd default flow) and tweak the caustics a bit (as in size and speed). This participation turned out to deliver an excellent map which has my vote for being 1st of the 4 participations that made it till the end (unless crun shows off an even more exciting piece of art). You are right about the noclipping on the bridge, I guess I missed that. Thanks for reporting. Whoops, forgot to mention I did found both HB the first run ^^. Also, what about some more decoration at the house? It's just standing all alone right now with no shed or outside entrance to a cellar. Not even a fence or so. I miss animals as well (which I also gave you with those NPCs). Maybe under the bridge would be a nice place for a secret? You stick to the wood when coming close. This speaks for itself; geometry issue. I just thought of another idea; what about "leaving" footprints inside the snow? I know this sounds like a mad idea, but in theory this could be done by taking a bump-map and specular map that display some footprints. As specular light isn't changing along the view of the camera (due the reason that specular light is "guided" by the bump-map), it should always appear from the same direction. Because you are navigating outside in a U-shape, rotating the bumpmap (rotate:4 or rotate:5) could change the direction of the specular light (or just use flipnormalmapy when it's a 24-bit TGA-file). Of course the best way would be a decal that fades away (which happens to specular light too quickly actually), but that's not an option, sadly. This is the absolute winner of the contest an my number #1. I really enjoyed the gameplay part with its outside area and the arenas inside and that not just one time. :p From my point the visuals are great and support your feelings while the playthrough verry well. -And another 10 point for the quad voting from me. In terms of the sp mapping contest, absolutely the winner. #1! Others have already commented on possible improvements, and I don't have much to add. I like that you've used elements from the rpg features in the map, namely the npc's with textboxes at the start. 9/10 because it could be slightly improved. Also, going into a tunnel on the way to the church, I got stuck on geometry and couldn't move or unstick myself. I also wanted to let you know that I'm wokring on the timelapse video and that it will be out soon. I'm just having trouble with the large filesizes and it's length (I recorded 85 hours of editing), so there will be, aside from the uncut version, which is more than 5 hours long, also a shorter edit (~15 mins) of the most interesting parts, that people can actually watch to the end. Finally managed to upload this huge timelapse video! It's five and a half hours long and I obviously don't expect anyone to watch the whole video, but I had to uplaod it as it was there and you might find one or the other part interesting. :) Would be nice if you leave a coment on YouTube too, but that's up to you of course! Perhaps you could have dropped certain scenes out of it (like creating specific arches and such). It feels like it's going way too fast to actually follow what steps you take. Perhaps just specific pieces of the map would give a better result. Seeing frames where you start up Sauerbraten once again isn't really helpful as well. I guess you aren't familiar with the command editmat? By using editmat air empty, all cubes which only contain material yet no geometry will be cleared to just air while selected cubes which do contain geometry won't. Although you should watch out for different gridsizes, it saves up a lot of time to get a way cleaner map. For the new beings which probably are going to ask how to change the colour of the outline, try outlinecolour (default 0 0 0).